Today was some sort of official Macaron Day. There seems to be an official day for everything now. I need to keep a special calendar full of all the important official days. Somehow I keep missing International Nutella Day, and that's just wrong! Anyway, today was Macaron Day NYC and from what I've read online, patisseries throughout New York handed out free macarons to customers all day. Now, we don't live in New York (boo!) and it seems that this special day was only celebrated there, but macarons are pretty damn tasty so we just had to join in the festivities. Unofficially. So, this afternoon after school we met up with a few friends and went on a macaron treasure hunt, visiting four local stores that sell macarons: Masse's Pastries, Virginia Bakery, Paris Baguette and Cafe Clem. To make it feel more like a treasure hunt I made up a simple map for the kids to follow. It's a good thing that three of these stores are on the one street, and the fourth is just down a side street. My map only needed two lines! We started our macaron treasure hunt at Masse's Pastries in the Gourmet Ghetto. Lola (as always) chose strawberry, Ava went for lemon, and I had the most delicious lavender and earl grey flavor. Mmm... so exquisitely delicious. From Masse's we headed to Virginia Bakery which is right next to Ava's school and a popular spot with the kids. Virginia Bakery doesn't have a large range of macarons, but what they lack in variety they make up for in size. Their macarons are huge! Ava went with chocolate this time and I had lemon. Lola was going to go with strawberry (of course) but then she spotted a butterfly shaped sugar cookie and just had to have that instead. It wasn't a macaron, but hey, why not? Mathilde shared a little of my lemon macaron and seemed pretty impressed. Check out her little pony tail! Doesn't she look hilariously cute? From Virginia Bakery we headed to Downtown and Cafe Clem. Cafe Clem is one of our all time favorite places. We often go there for a treat after swimming lessons at the YMCA or after the library, which is right next door. Surprise, surprise, Lola chose strawberry. Ava chose caramel and I decided to skip the macaron this time and get a lemon tart. Cafe Clem make the best lemon tarts. I also got a coffee in a bowl. I love how they serve their coffee and hot chocolate French style in a bowl. The kids played in the nearby water feature after they'd eaten their macarons. You'll notice that Lola and her friend Sky have wet hair in the photos from here on out. I have no idea how they ended up with such wet heads but dry bodies! The last stop on our macaron treasure hunt was Paris Baguette by the Downtown Berkeley BART station. By now the kids were running on a total sugar high! Apologies to anyone else who was in there the same time as us and looking to have a nice quite coffee! The kids all went with raspberry this time. Contrary to what the photo says below, the raspberry macarons aren't actually more expensive than the other flavors - they just accidentally had the sign for the extra large macarons in the wrong place. Oh yeah, they sell extra large macarons. The regular size was just fine for us today though. Maybe another day when the kids haven't already eaten three other macarons we'll go for the big ones. As I mentioned, the kids were pretty hyped up on all that sugar by the end of our treasure hunt. They needed to get outside and run around. As luck would have it there was a Klezmer street party and Yiddish flash mob happening in front of Paris Baguette as part of the Jewish Music Festival. The kids kicked up their heels and spun around holding hands to the music for a good half hour. That had to have worked off some of that sugar, right? We had so much fun going on our macaron treasure hunt this afternoon. It has inspired me to take the girls on more treasure hunts. Maybe a few nature related treasure hunts along the bay or up in the hills, as well as more food related treasure hunts. Do you take your kids on treasure hunts? I'd love to hear any ideas you might have for quirky treasure hunts. P.S. 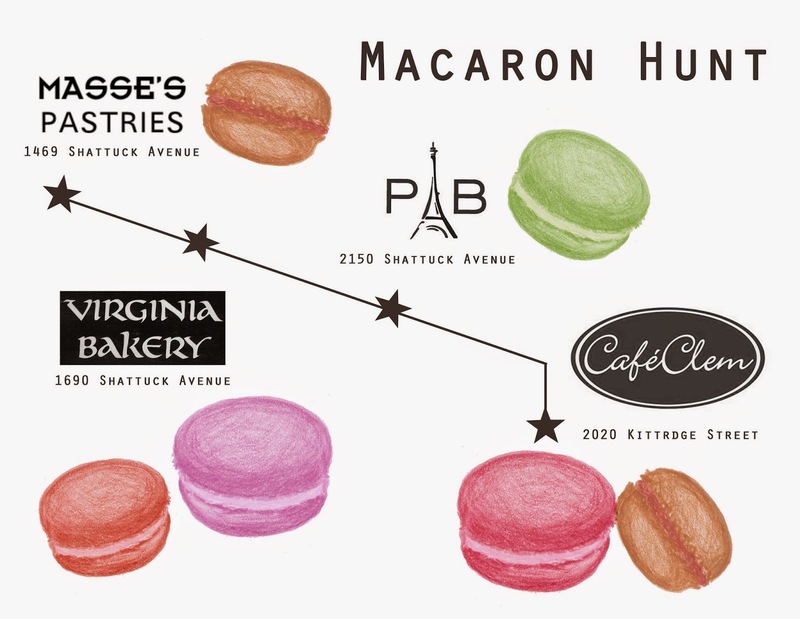 If you're in Berkeley and you'd like to follow the macaron treasure hunt map that I made you can download a copy here. What a great idea! Thanks for sharing the map. My girls will love it!